IS THERE REALLY any harm in taking a picture of yourself and putting it online? Or are we all rapidly becoming a new generation of narcissists? As far as fads go, the selfie has transcended most. The term ‘selfie’ even made its way into the Oxford English Dictionary as the word of the year in 2013. 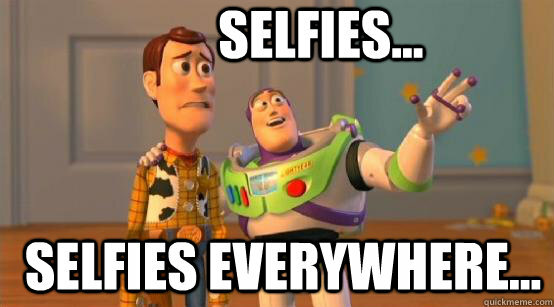 And in 2014, the popularity of selfies only grew. From charity campaigns to Kim Kardashian-West going as far as to make a selfie book for her husband, there is no denying the power of the selfie reign. But was this craze just the next step on our path as a society of narcissists? Should we have seen this one coming? Up until the introduction of social media, the media we knew focused more on fictional worlds and societies like those of sitcoms and soap operas. Sure, some may have been based around or inspired by real-life but even Jerry Seinfeld fictionalised himself. Then along came the reality TV boom in the 90′s. This made common viewers potential ‘stars’ in their own right and thus, our societal transformation from consumer to consumable was almost complete. Social media was the final nail in the coffin for our humility in a lot of ways. From the very first site to now, these companies have been playing on our love of self-promotion and exhibitionism as they willingly turned us into the consumable products we are today. MySpace fed the dreams of aspiring musicians in the same way Tumblr and WordPress brought out the creativity and writers inside us all. Facebook replaced our phone books and diaries, while YouTube gave us our own TV channel. Twitter meant we could literally put our thoughts in the cloud as quick as they drop into our brain and express our undeniably valid opinions while LinkedIn gave us the ultimate tool for self-promotion. Tinder takes that self-endorsement to a whole new level of egotistical while Snapchat has given society the ultimate tool for some friendly, transient sexting. Instagram has arguably given us the entire stage. We can promote shamelessly on Instagram to our hearts content and here, it is applauded and even encouraged. Common folk on Instagram can quickly have as many ‘followers’ as the celebrities we stalk, if you adhere to the levels of grandiose exhibitionism required. This level playing field is a potential danger though. The difference between celebrities on Instagram and a common user, despite maybe having the same or more followers, is their level of success and the work they put in to achieve it. Instagram is simply an outlet to most users but to some, they see it as a path. This isn’t necessarily a bad thing but it becomes dangerous when it is treated as the only path and hard work and graft get ruled out. Nothing is more detrimental to yourself and to society than a sense of entitlement combined with little or no work ethic. It’s not all bad. We were narcissists long before Instagram. Obviously, not everyone who uses Instagram, or posts selfies, falls into this category but this type of shameless self-promotion and sense of unrealistic entitlement is certainly on the rise. In fact, our narcissistic behaviour has been on the rise for decades. And interestingly, our patterns of association with others have evolved since the advent of Facebook and Twitter, showing a decline in our empathy and selflessness towards others. So, we are becoming less bothered about others and their general well-being, but we are very bothered about their opinions of us. TheJournal.ie spoke to Dubliner Lauren Bejaoui, who is rapidly becoming one of Ireland’s most prolific users of Instagram. I kind of dabble between just posting selfies or just posting inspirational imagery. It really depends on my mood. I think habit compels me to post them and expectation too! …other people do the worrying for me. I’ve always been in touch with myself, especially physically. Being myself and open in general has worked for me and I’d recommend it to anyone. As of now its strengthening my long term goals. It’s quite easy to accumulate an organic following especially with the use of selfies. Its basically self promotion, you’re selling yourself to companies based on how you look and what you ooze aesthetically. It’s not all freebies and modelling jobs though, Lauren has experienced the dark side to the internet and the wrath of the many trolls that live in cyberspace. I’ve had girls threaten to pour boiling water over my face. That was terrifying and I hid from the internet for some time. That was my worst experience so far. I don’t post as many revealing pictures as I used to, purely because I am only starting to enjoy the rewards of keeping that part of me private again. It’s all about finding a healthy balance. Does your selfie show us more than how you look? Balance really is key and it is a fine line when it comes to these types of posts. The fact that the dictionary definition specifies sharing these images on social media is reflective of the type of thinking they so widely induce. Two out of three of all the patients who come to see me with Body Dysmorphic Disorder since the rise of camera phones have a compulsion to repeatedly take and post selfies on social media sites. …I went through a stage of being desperate to please everyone and I became a self-conscious shell of myself. There was a pressure to be absolutely perfect, a pressure I put on myself via the internet. Thankfully, I got myself out of that hole and began to understand that being perfect is just not possible and Instagram became a healthy hobby once again. There is no doubt that there is an increase in the number of young adults who present themselves at my clinic for therapy relating to distorted body image. The selfie onto itself is harmless. But when you attach it to all the other social media elements, that can lead to self-criticism among the emotionally vulnerable and I feel you are dealing with yet another potentially harmful social tool. Needless to say, most Instagram users and people who post selfies are definitely not narcissists. But outlets like Instagram and social media sites can be to narcissists what alcohol is to an alcoholic. It has been scientifically proven that the amount of status updates, the number of followers and friends, check-ins and posts on social media have a direct relation to people’s levels of narcissism. A narcissist is much more likely to take advantage of social media outlets as a way to showcase a desirable but unrealistic image of themselves and their lifestyle. Social media channels fulfill their needs and allow them to broadcast their life shamelessly to an audience of virtual friends and followers. We all want to feel that we matter. We all want to feel that we are valid. And as humans, every one of us are beautifully flawed. At some level we all struggle with validation and feeling good enough. It has been said that when we are 20 years old we worry about what others think of us. When we are 40 we don’t give a damn what anyone thinks of us. And when we are 60, we realise that nobody has been thinking of us at all. We all think about ourselves and that’s fine, as long as we are balanced in our self-acceptance and our self-criticism. It’s really only when this goes beyond normal levels and becomes a never-ending quest for approval that it is an issue. This type of behaviour can affect a persons career, friendships, relationships and line of thinking. Ultimately, all of our social media activity could stem from a need for approval or act as a cover-up for dwindling self-esteem. Albeit, the current set-up of these outlets allows this type of behaviour to be championed and reinforced at an astronomical level which is what causes the narcissistic tendencies and delusions to grow. There are already countless examples of how living our lives online has benefited us in the form of social data being used for social good. But is there anything to be said for an algorithm that could be built into our social media pages, alerting us to our increasing levels of self-promotion? Or have we simply gone too far? Email “The good, the bad and the ugly: Are selfies turning us all into narcissists? ”. Feedback on “The good, the bad and the ugly: Are selfies turning us all into narcissists? ”.